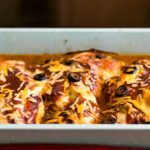 An Easy Mexican inspired chicken bake that is grain free and low carb. Preheat oven to 400 F (200 C), and lightly oil or grease a 9 x 13 baking dish. Add ¼ cup of salsa to the bottom of the pan. Layer chicken breasts on top of salsa. Spoon green chilies over chicken. Pour remaining 1 cup of salsa over the top of chicken. Sprinkle both queso quesadilla cheese and cheddar cheese over the top of salsa. Scatter sliced olives over the top. Bake for 30 to 40 minutes, or until chicken is done in center. Top with chopped avocado & garnish with optional chopped cilantro and add a ½ tbsp of sour cream to each serving if desired. Serve.